I can't believe a year has gone by already, but Day of the Dead - or Día de los Muertos is a little over one month away! So you know what that means, don't you? Lots of goodies coming up on MommyMaestra! There are so many activities here on my site for kids to make, read, watch and more. But it can be tricky to find all of them, so I've created this living calendar to help you! It includes links not just to resources on MommyMaestra, but also to other sites who are insanely clever. 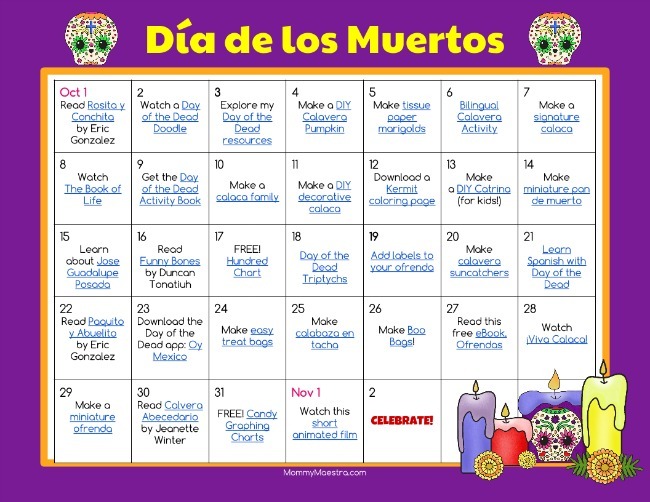 My Day of the Dead Activity Calendar is full of 32 resources for celebrating the holiday with your children. Please note that a couple of the book links are affiliate links to my Amazon store. And you know what happens when you buy one them? Amazon puts a small percentage on a gift card for me to buy more books for my kids and to share reviews with you. I hope you all enjoy my Day of the Dead Activity Calendar!